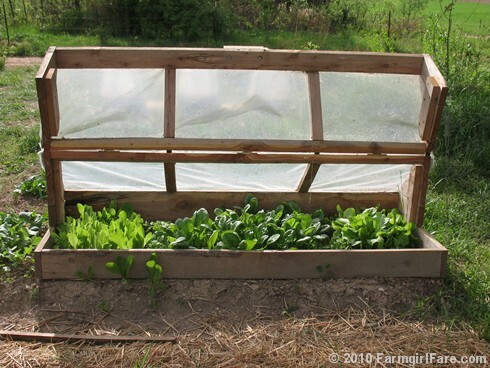 In all my years of gardening, I've never used a cold frame—and I love cold frames. Several Amish families moved to this area two years ago, and in my opinion we're all the luckier for it. The Amish neighbors I've met so far have all been very friendly, and they've already brought much to our rural community. There are three basket makers and a furniture maker. The rough cut siding on our new sheep barn came from the Amish sawmill down the road. One of the families sets up a stand next to their house each summer and sells organic produce from their large garden. They grow wonderful sweet corn, and I think I ended up buying most of their tomato harvest last year. The stand is run on the honor system so you can shop anytime; the very reasonable prices are posted, and you just leave your money in the coffee can on the table, making change if you need it. I love the convenience, but I'm always hoping the wife and/or husband will be home whenever I stop by, as we usually have interesting talks about gardening, sharing our successes and failures, trading growing tips, and laughing. I always learn something new. The husband's brother lives with his wife and young children on the farm next door, and the two brothers do carpentry work. They're the ones who built our sheep barn last fall, and they came back last month, along with a young apprentice, to build us a big new haybarn. Since they drive their horse drawn buggy to work, part of the deal is that you have to go pick up their gas-powered table saw, ladders, and any other big tools in your truck before the work begins, and then bring them back when the project is complete. You also have to provide a place for their horse. These guys usually only take jobs that are within a 10 mile radius from their farms, but fortunately they made an exception and traveled a few extra miles to work for us. While we were picking up the tools a few days before construction on the haybarn was set to begin last month, I spied this cute cold frame in their small front garden. The Amish don't like to be photographed, and of course I respect their wishes, but oh, the wonderful photo opportunities I've missed! Fortunately they don't seem to mind the fact that I'm always pointing my camera at everything else except them, so it didn't seem odd when I asked if I could snap a few pictures of a cold frame. As for whether it's an authentic Amish cold frame design, I have no idea. He said they had one similar to it back home in Ohio, but the top didn't open; you had to lift the whole thing up and move it off the plants on sunny days. My favorite part about this one is how cleverly it opens up. I love the shape, too; it looks like a little house rather than simple a box. This isn't a particularly complicated project, and I thought that if I photographed every angle and detail of it, some of you handy types would be able to figure out how to build one for yourself if you liked it as much as I do. As I said, it measures 24" x 66", but you could adapt the design to pretty much any size. Actually, at the time I was taking these photos it was for purely selfish reasons. My hunky farmguy Joe also happens to be one of those handy types who doesn't need plans to build things, and I'm hoping that I can get him to build me my very first cold frame for fall—or at least before next spring. If not, I know somebody who might be talked into making me one—and I won't even have to drive over and pick up his tools first. 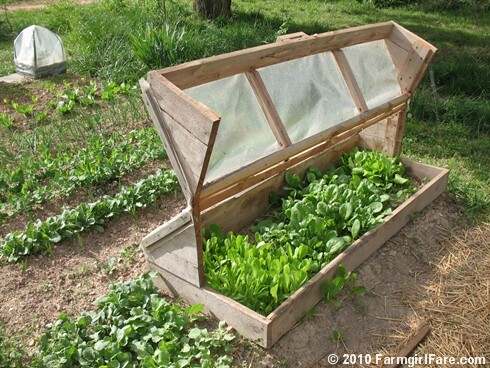 Do you use cold frames in your garden? 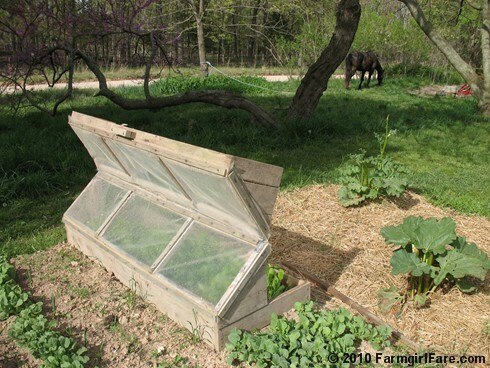 If you've shared cold frame photos on your own blog or on flickr, you're welcome to include a link in your comment—I'd love to see them! © FarmgirlFare.com, the laid back and low key foodie farm blog where we never mind being 'stuck' behind an Amish buggy on the highway—unless it means somebody else is going to beat us to all the sweet corn. What a beautiful cold frame! I'm going to have to my hubby make me one of these. Of course, I've been asking him to build me a rustic coffee table for a year now so I don't know how soon that'll be! This is our cold frame that we put together this year. This is what we grew in it. I love this design for my boxes that are only 6 inches deep. I am gonna have to sweet talk my farm guy into one of these. Isn't that amazing! I don't have that kind of talent but I'm sure my dad could be convinced to make one for me. I hope to be able to do it again this fall to extend our season here in Mid-Missouri. very easy - no carpentry and easy to bust down and move somewhere else. I've only started gardening again the past couple of years, but saw one of these at our SOMO store and it's on our list for next early Spring. Thanks for the info! 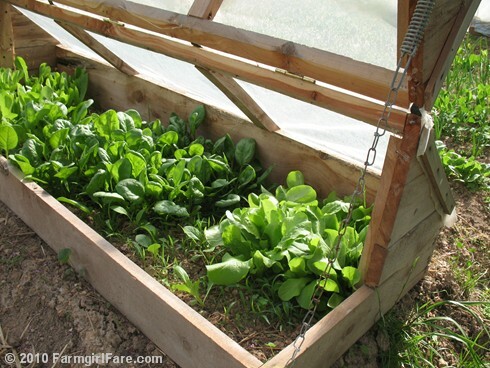 What a brilliant cold frame! I wish I'd had one last Tuesday night.. I lost my tomatoes to a late frost! Ours is even simpler than that--basically an angled box with an old window as the cover. And yes, I use it. And occasionally kill things in it. Whoopsy. Here's the post about THAT stupidity . 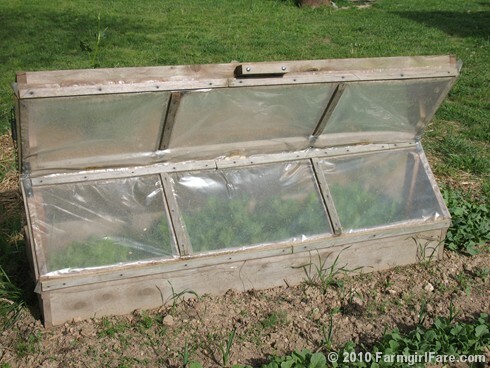 . .
That's a great coldframe. Things are just made better when the projects plans are passed down gereations. Here is what I use in my tiny urban garden - umbrella greenhouses! Hi there - I picked up the link to your blog from Fennel and Fern. What a fantastic cold frame - much better than the plastic and metal job I use (which invariably falls apart each time I open it). Another job to pop on that ever growing list! 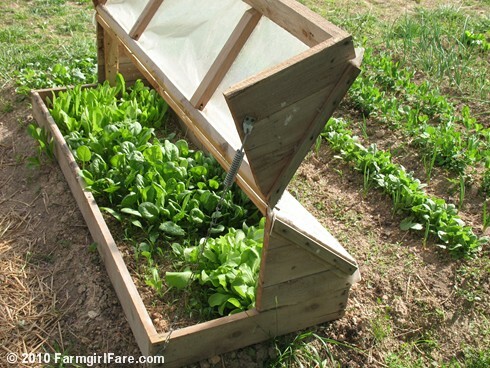 A cold frame is on my wishlist/to do list for our garden next year. I LOVE the design of this one ... I think I am going to ask my husband to study it and see if he can replicate it. I nominated you for a Sunshine Award. Stop by http://www.snugglymonkey.com/ sometime to pick it up! Have a great day! This is the first year I'm using a cold frame... I made myself a hoop house type cold frame and I am very proud of it. I used what I had laying around except for some pieces of rebar, so it was very affordable ($10!). I made it so it comes down easily and in the fall I'll be able to put it up again over any garden bed that I will want to try and extend the season with. To get the hang of it this spring, I just used it for my started flats and it's working beautifully! Very interesting article. I grew up in Southeastern Minnesota where many Amish have migrated in the '70s and do they make beautiful, high quality furniture. I love the cold frame. I use the raised bed garden technique and cover it with plastic sheeting held up with pvc tubing which works pretty well. Your cold frame looks much sturdier though. Thanks for sharing. Here is my cold frame. It is south facing and has a concrete block wall behind it that acts as a heat source over night. It is based off of the idea of passive solar greenhouses. I grew up right next to Holmes County in Ohio, which is basically ALL Amish and Mennonite. My dad drills water wells and has worked on Amish farms as long as I can remember. "This is Eli Yoder on Rt 30. I'm calling for John Miller. His pump is out." "Oh, you go out Rt 30 about 4 miles and go to the north when you come to the Old Pasture road about half a mile past Trail. Then you follow that road for another mile and go East when you see the new barn..."
I love the cold frame! It would work really well where I live in the cold part of the world. Thank you for sharing. I have already put an order in with my husband. Now I just have to hope that he gets to it before winter! 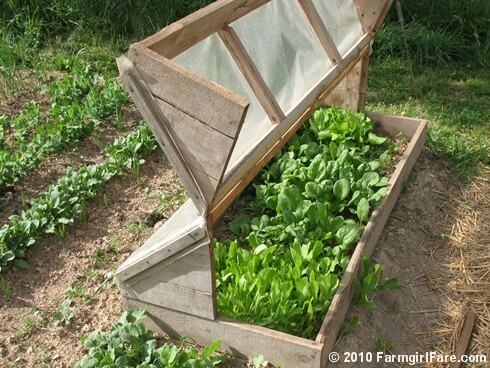 I have just this moment discovered your blog and what do I find but THE MOST AMAZING COLD FRAME I HAVE EVER SEEN. I will be building one of these very soon. Thank you so much for the great photos! Who needs more direction than this!! Love the cold frame and the surrounding garden. These are serious faming folk! 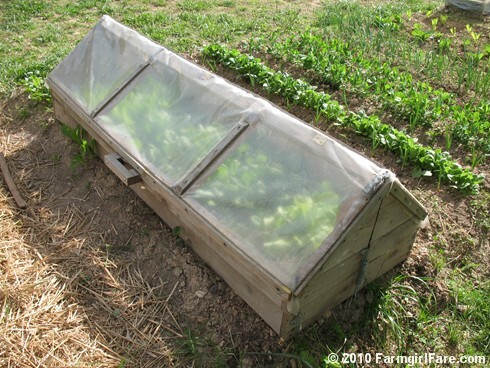 I've used an assortment of cold frames and green house beds over the years and am struck by the practicality of this design. When the winter is over and early summer dawns, change the plastic for mesh and you have a cover for strawberry beds. The dear deer in our neighborhood will eat strawberry plants to the ground. Just may get into strawberries this year with that sort of baffle! Thanks so much for this wonderful idea. I can't wait to get my husband to build it! 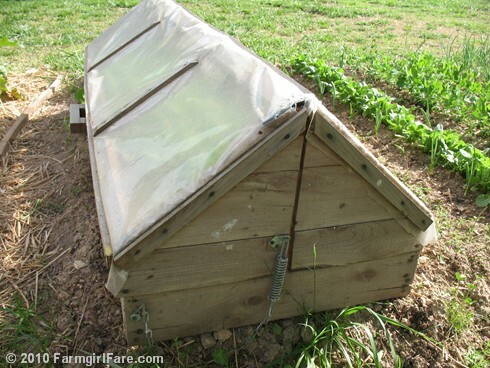 Hi, I love this cold frame design. May I post a link from my blog?